The first record of Acupuncture is found in the 4,700 year old Huang Di Nei Jing (Yellow Emperor's Classic of Internal Medicine). This is said to be the oldest medical textbook in existence. 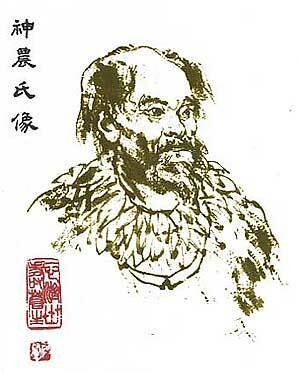 It is said to have been written down from even earlier theories by Shen Nong (Shen Nung), the father of Chinese Medicine. Shen Nong documented theories about circulation, pulse, and the heart over 4,000 years before European medicine had any concept about them. As the basis of Acupuncture, Shen Nong theorized that the body had an energy force running throughout it. This energy force is known as Qi. The Qi consists of all essential life activities which include the spiritual, emotional, mental and the physical aspects of life. A person's health is influenced by the flow of Qi in the body, in combination with the universal forces of Yin and Yang. If the flow of Qi is insufficient, unbalanced, interrupted or blocked, Yin and Yang become unbalanced, and illness occurs. A depiction of Shen Nong 神農 (Divine Farmer). He is believed to have classified 365 species of herbs or medicinal plants, including tea. Qi travels throughout the body along special pathways or "Meridians." The Meridians, (or Channels), are the same on both sides of the body (paired). There are fourteen main meridians running vertically up and down the surface of the body. Out of these, there are twelve organ Meridians in each half of the body (remember they are in pairs). There are also two unpaired midline Meridians, one along the midline of the front of the body, and one that runs along the back midline. The acupuncture points are specific locations where the Meridians come to the surface of the skin, and are easily accessible by "needling," Moxibustion, and Acupressure. The connections between them ensure that there is an even circulation of Qi, and a balance between Yin and Yang. Energy constantly flows up and down these pathways. When pathways become obstructed, deficient, excessive or unbalanced, Yin and Yang are said to be thrown out of balance and this is what causes illness. Acupuncture restores that balance. 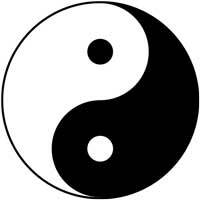 The taijitu is a Chinese symbol for the concept of yin and yang. Yin and Yang is an important theory in the discussion of Acupuncture treatment, in relation to the Chinese theory of body systems. As previously stated, Qi is an energy force that runs throughout the body. In addition, Qi is also ubiquitous in nature as well, it is the energy in all things. Qi is comprised of two parts, Yin and Yang. Yin and Yang are opposite forces, that when balanced, work together. Any upset in the balance will result in natural calamities, in nature; and disease in humans. Yin is signified by female attributes, passive, dark, cold, moist, that which moves medially, and deficient of Yang. Yang is signified by male attributes, light, active, warm, dry, that which moves laterally, and deficient of Yin. Nothing is completely Yin or Yang. The most striking example of this is man himself. A man is the combination of his mother (Yin) and and his father (Yang). He contains qualities of both: This is the universal symbol describing the constant flow of Yin and Yang forces. You'll notice that within Yin, there is Yang, and within Yang, there is the genesis of Yin. Whether or not you believe in Daoist (Taoist) philosophy, (which all Chinese Medicine theory is based on), one thing is indisputable: Acupuncture works. Acupuncture is a technique utilizing fine sterile disposable stainless steel needles inserted at specific points in the body in order to correct various ailments and normalize the body’s physiological processes. Where the needles are applied and the depth of their insertion is determined by the nature of the problem. Traditional Chinese Medicine holds that there are as many as 2000 acupuncture points on the human body. The ancient Chinese believed that there is a universal life energy called Qi present in every living creature. This energy is said to circulate throughout the body along specific pathways called meridians. As long as this energy flows freely throughout the meridians, health is maintained, but once the flow of energy is blocked, the system is disrupted and pain and illness occur. Electro Acupuncture involves sending a weak electrical current through inserted acupuncture needles to stimulate acupuncture points. A slight throbbing or tingling sensation may be felt during treatment. This modality is usually employed for severe pain and other musculoskeletal conditions. Cosmetic Acupuncture is an effective, non-surgical treatment used to reduce the signs of aging. It has been used in China for more than two thousand years. Tiny sterile needles are inserted into the face along meridian lines and acupuncture points to increase blood circulation. The face receives an increase of blood to nourish, oxygenate and moisturize the skin from the inside out. Cosmetic acupuncture also stimulates the production of collagen, giving the skin a firm, tight look. 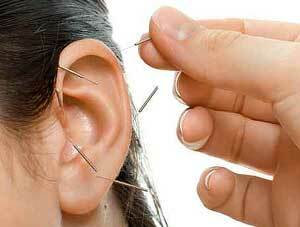 Auricular acupuncture is acupuncture specifically of the ear. The ear is a microsystem of the entire body and is widely used for many conditions, including addiction treatment, mood disorders, obesity, pain, and other conditions. This medical system emphasizes a holistic approach to medicine, an approach that treats the whole person. The acupuncture points found on the ear help to regulate the body’s internal organs, structures, and functions. Auricular therapy has been shown to stimulate the release of endorphins, the body’s own feel-good chemicals. Slight changes were made to fit the stylistic requirements of Qi Encyclopedia.